Ensign Marc Edwards of England had hardly taken up his post at the garrison of tiny Fort York in Toronto when he gets a call from the Governor, Sir John Colborne, to investigate a murder in the hamlet of Crawford Creek, near Cobourg. Sporting his flaming red coat, Edwards sets off for what becomes a hectic week in the farming suburbs. The time is l836. While Edwards was expecting a dull time in the colonial backwater, what he finds is a population chafing under British rule, angry at the Family Compact in Toronto, upset by the Clergy Reserves, sympathetic to the Reform Party, as well as fighting off American immigrants who are trying to introduce republicanism into Canada, and a powerful smuggling ring which may or may not have been responsible for the murder. The Canadian author, Don Gutteridge, taught English at the University of Western Ontario. He has also done a great deal of research on this period of Canadian history before he started up the Marc Edwards mystery series. The second book is called “Solemn Vows”. 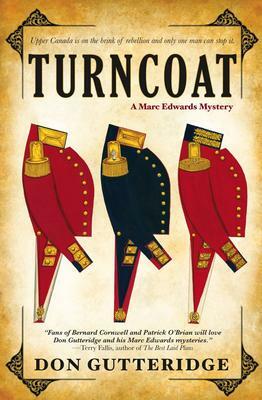 What we get in “Turncoat” is the spirit of the period and the political tensions that led to the Upper Canada Rebellion of l837. There is a thrilling episode when young Edwards rescues William Lyon Mackenzie from an angry town hall meeting. The book is very well-written and its fast pace gives a fascinating picture of early Canadian history. Come on down to Books on Beechwood on Saturday, February 5th and meet local Ottawa author Hugh McCord. He will be here signing his new book “Personal Reflections of Ottawa Past” between 11:00am and 1:00pm. Be sure to stop by on Saturday, between 11:00am and 1:00pm to meet Hugh, have a chat, buy a book, and get it signed! We look forward to seeing you all then.